Heat oven to 350°F. Bake biscuits as directed on can. Cool 15 minutes. Meanwhile, in 10-inch nonstick skillet, cook brown sugar, butter and coffee liqueur over medium heat, stirring constantly, 3 to 5 minutes or until slightly thickened. Stir in bananas; cook 2 to 3 minutes. Remove from heat; keep warm. Heat closed medium-size contact grill or panini maker for 5 minutes. Spray grill plates with Crisco® Original No-Stick Cooking Spray. Split biscuits. Spread 1 tablespoon of the chocolate hazelnut spread on cut side of each biscuit bottom to within 1/2 inch from edges; top with remaining biscuit halves. Place filled biscuits 3 to 4 at a time on grill; close grill. Cook 1 to 2 minutes or until golden brown. Repeat with remaining 4 filled biscuits. 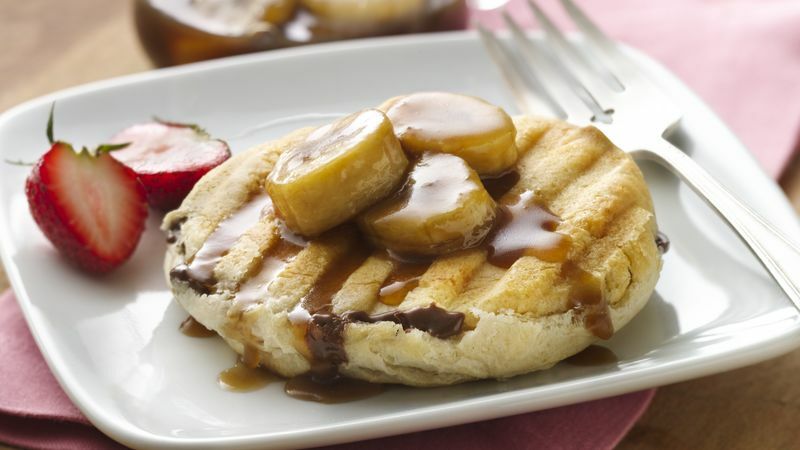 Top panini with bananas and syrup. Garnish with strawberries.